minimal syntax, comprised of only three elements. prefix notation, in which functions manipulate the remainder of the program itself. panmorphic typing, allowing programming without data types. a trivial-to-parse data transfer format. unicode-correct: any UTF-8 text (without byte-order marker) defines a valid Om program. embeddable into any C++ or Objective-C++ program. extensible with new data types or operations. complete. Although the intent is to develop it into a full-featured language, the software is currently at a very early "proof of concept" stage, requiring the addition of many operations (such as basic number and file operations) and optimizations before it can be considered useful for any real-world purpose. It has been made available in order to demonstrate the underlying concepts and welcome others to get involved in early development. stationary. Om will likely undergo significant changes on its way to version 1.0. This program and the accompanying materials are made available under the terms of the Eclipse Public License, Version 1.0, which accompanies this distribution. For more information about this license, please see the Eclipse Public License FAQ. Building a stand-alone interpreter from a script-generated build project. Including as a C++ header-only library. The Development version (to which this documentation applies) can be obtained via Git clone or archive file. Released versions can be obtained via archive files from the GitHub tags page. Arguments include the desired project name (required), followed by any desired CMake arguments. -D Icu4cInstallDirectory:Path="[absolute ICU4C install directory path]"
-D BoostInstallDirectory:Path="[absolute Boost install directory path]"
Accepts an optional command-line argument that specifies the desired UTF-8 locale string. The default value is "en_US.UTF-8". Reads input from the standard input stream, ending at the first unbalanced end brace, and writes output to the standard output stream as it is computed. The Om.Test target builds the test executable, which runs all unit tests, as "[Om build directory path]/executables/[platform]/[configuration]/Om.Test". These tests are also run when building the RUN_TESTS target (which is included when building the ALL_BUILD target). "html": This HTML documentation. To view in a browser, open "index.html". "xml": The XML documentation, which can be read by an integrated development environment to show context-sensitive documentation. Add the Om "code" directory to the include path and include the desired files. Inclusion of any operation header files will automatically add the corresponding operation to the global system. Include "om.hpp" to include all Om header files. Configure the project to link to the code dependencies as necessary, built with the correct configuration for the project. See the dependency "build.cmake" scripts for guidance. Call the Om::Language::System::Initialize function prior to use (e.g. 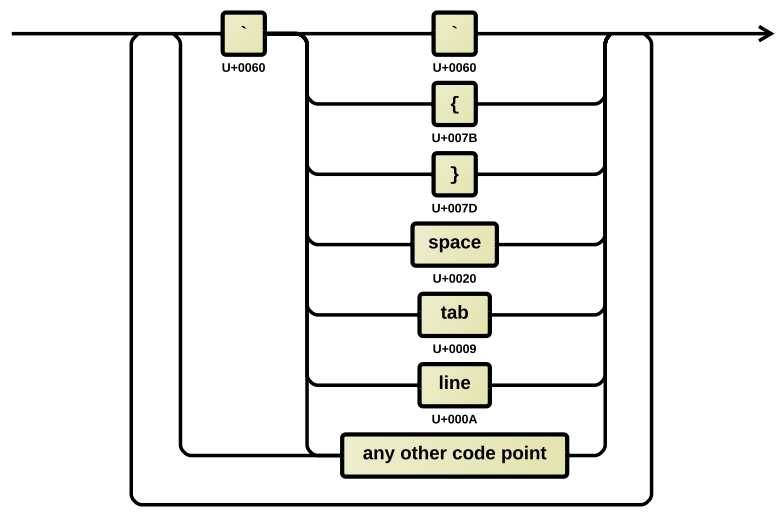 in the main function), passing in the desired UTF-8 locale string (e.g. "en_US.UTF-8"). Construct an Om::Language::Environment, populate with any additional operator-program mappings, and call one of its Om::Language::Environment::Evaluate functions to evaluate a program. For more in-depth usage of the library, see the Om code documentation. Backquotes (`) in operators are disregarded if the code point following is not a backquote, operand brace, or separator code point. The Om language is concatenative, meaning that each Om program evaluates to a function (that takes a program as input, and returns a program as output) and the concatenation of two programs (with an intervening separator, as necessary) evaluates to the composition of the corresponding functions. Unlike other concatenative languages, the Om language uses prefix notation. A function takes the remainder of the program as input and returns a program as output (which gets passed as input to the leftward function). Prefix notation more closely models function composition. Instead of storing a data stack in memory, the Om evaluator stores a composed partial function. The evaluator can read, parse and evaluate the input stream in a single pass, sending results to the output stream as soon as they are evaluated. This cannot be done with a postfix, stack-based language because any data on the stack must remain there as it may be needed by a function later. Functions can be optimized to only read into memory the data that is required; stack-based postfix languages have no knowledge of the function to apply until the data is already in memory, on the stack. Incoming data, such as events, become simple to handle at a language level: a program might evaluate to a function that acts as a state machine that processes any additional data appended to the program and transitions to a new state, ready to process new data. An integrated development environment can provide hints to the user about the data that is expected by a function. Only the terms (operators and operands) of a program are significant to functions: separators are discarded from input, and are inserted between output terms in a "normalized" form (for consistent formatting and proper operator separation). Identity: A function whose output program contains all the terms in the input program. Constant: A function whose output program contains a term, defined by the function, followed by all terms in the input program. If the computation is completed, the rest of the input terms are pushed onto the output program. If the computation cannot be completed (due to insufficient operands), the operator that names the operation is pushed onto the output program, followed by all remaining input terms. The empty program evaluates to the identity function. Separator: Evaluates to the identity function. Operand: Evaluates to a constant function that pushes the operand, followed by all input terms, onto the output program. Operator: Evaluates to the operation defined for the operator in the environment. If none, evaluates to a constant function that pushes the operator, followed by all input terms, onto the output program. Programs that contain multiple elements can be considered a concatenation of sub-programs that each contain one of the elements. The concatenated program evaluates to the composition of the functions that each sub-program evaluates to. Function B receives the input, and its output becomes the input for function A. Function A receives the input, and its output becomes that of the composed function. Any programs may be concatenated together; however, note that concatenating programs "A" and "B" without an intervening separator would result in a program containing a single operator "AB", which is unrelated to operators "A" or "B". All operation implementations provided are documented in the Operation module. There are no traditional data types in the Om language: every data value is represented by an operand. The Om language uses a unique panmorphic type system, from Ancient Greek πᾶν (pan, "all") and μορφή (morphē, “form”), in which all data values are exposed exclusively through a common immutable interface. In the case of the Om language, every data value is entirely represented in the language as an operand. Any operation will accept any operand as a valid input and interrogate its data solely through its contained program (a sequence of operator, separator, and/or operand). The operation is then free to process the data however is appropriate, and any operand that it produces as output can then be interrogated and processed by the next operation in the same way. Each operand in memory actually contains one of several possible program implementations, each optimized for a specific set of operations. For example, some operations treat separators as insignificant; operands produced by these operations could contain a program implementation that stores only terms (operators and/or operands) and presents a "normalized" separator (such as a line separator) between each term. Operations can interrogate an input operand for its program implementation type; if it is the optimal implementation type for the operation, the operation can manipulate the operand directly to produce the same result more efficiently. Operations in a program can be ordered by the programmer to increase performance by minimizing conversions between program implementations, but it is not necessary for obtaining a correct computation. Where relevant, an operation will document the program implementation types of its inputs and outputs to allow for this optional level of optimization. All program implementations provided are documented in the Program module. The first term is popped from the Source. If the Remainder is empty, the Result is output. Otherwise, Function, Result, and Remainder are passed to a recursive [Fold]<- call. The Operation list is very short at the moment; as it expands, higher-level constructs should allow for simplification of algorithms such as this one. When reading Om code, it can be difficult to mentally group operations with the operands they consume (contrasted with Scheme, in which they are grouped at design time with parentheses). However, it should be possible for an Om integrated development environment to generate a graphical indication of these groupings dynamically. By Developing new Operation and Program classes. By Reporting Issues via bugs, patches, or enhancement requests. By Funding further development of the Om language. Om is written in modern, portable C++ that adheres to the Sparist C++ Coding Standard. Note: Because this is an early-stage project, there are not yet any compatibility guarantees between versions. Om code can be forked from the Om GitHub repository. See the Using section for instructions on building the code. When adding or removing files from source, re-run the "generate" script from the build directory to update the project. Additional native functionality can be added to the Om language by implementing new operations in C++. There are two ways to implement an operation: as a composite operation, or an atomic operation. Define the operation class in the Om::Language::Operation namespace. Define the static GetName() method, which returns a static char const * containing the name. Define the static Give(Om::Language::Evaluation &) method, with no return value, to give existing operations and/or elements to the evaluation. Define the operation class, derived from Om::Language::Operation::DefaultIncompleteOperation (which has the operation class as its template argument), in the Om::Language::Operation namespace. Implement the functions necessary to compile. Optionally override virtual function implementations in Om::Language::Operation::DefaultIncompleteOperation that may be more optimally implemented in the operation. New data types can be added to the Om language by extending Om::Language::Program and defining the functions necessary to instantiate the class. Use existing programs as a guide. Program types should be defined in the Om::Language namespace. Download and install CoverStory. In Preferences, add "*.ipp" and "*.hpp" to the "SDK Files" list. Build and run the Om.Test target. The left pane shows a list of Om source files, each accompanied by a test coverage percentage. The right pane shows the contents of the currently selected source file, with each line annotated with the number of times it was executed. Changes can be submitted to Om via pull request. Issues are reported and tracked with the Om GitHub issue tracker. Before reporting an issue, please search existing issues first to ensure that it is not a duplicate. The Om language is currently a spare-time project of one person. If you would like to speed the development of the Om language in either a general or domain-specific direction, please contact me at information@sparist.com.